1969 was another great year for music. As the year goes on I am planning on featuring 52 of the best and most significant albums of the year- one a week- I will try to feature the albums near the date in which they were released. It was fifty years ago today- January 5, 1969- Creedence Clearwater Revival released their second album Bayou Country. It would be the first of three Creedence Clearwater Revival albums released in 1969- slackers! Creedence Clearwater Revival released their debut less than a year earlier in May 1968. It was a promising debut but did it give more than a hope of the greatness to come? The two most well known songs on that debut were covers- I Put A Spell On You and Susie Q. I got acquainted with the great CCR after the fact- if I had heard the debut when it was released would I have been all that excited about this group? Maybe not. The debut went to #52 on the album charts, I Put A Spell On You #11 on the Hot 100, Susie Q #58. While the debut may have been at least promising it would not make any lists of greatest debuts ever. I do think when I heard the follow up- Bayou Country they would have gotten my attention. On Bayou Country- Creedence’s frontman John Fogerty wrote six of the seven songs and they show a big jump in quality over his songs on the debut. The most famous song he would ever write is on this album-the song that really established the band – Proud Mary. If he had only written Proud Mary, John Fogerty would be remembered today. The single went to #2 for the band in 1969 and a year later Ike & Tina Turner’s version- which is just as great went to #4. There are classic rock songs that after decades I just get tired of hearing- but Proud Mary has never fell into that category- [I can’t think of any CCR songs no matter how often I’ve heard them- that wear thin, I think their music holds up well.} 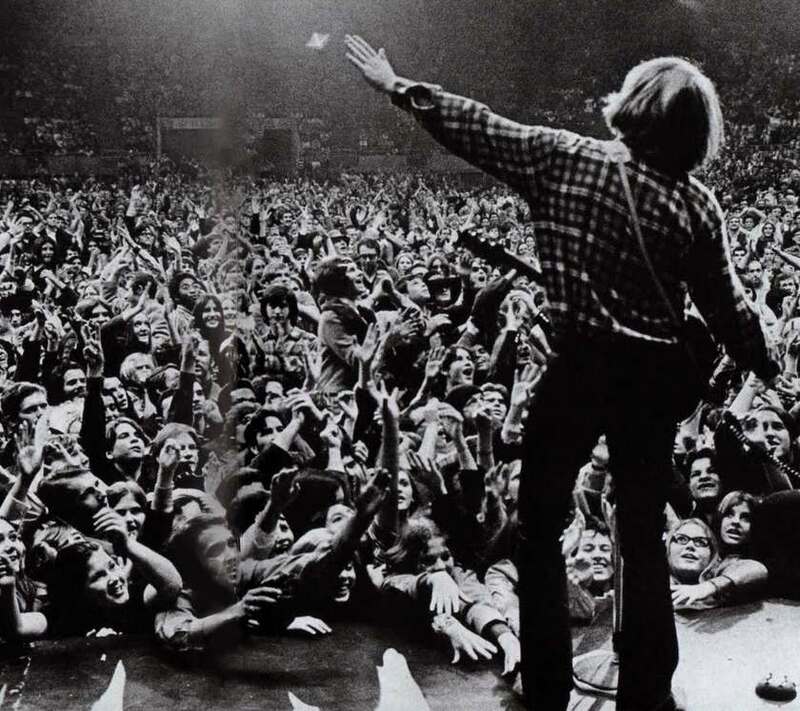 Fogerty wrote the song two days after being discharged from the National Guard. When he wrote Proud Mary he has said he immediately knew he had written something significant. The opener is Born On The Bayou- the should have been the hit follow up- but it was the b-side to Proud Mary and never charted. I couldn’t tell you what makes a hit single this century but I think I have a pretty good ear for the second half of the 20th century- and this is a song that sounds to me like it should have been a hit. The song is set in the south- I remember being surprised when I first got into CCR that these fellas were from California. I thought for sure they were from the south- the deep south. For a guy who had never lived or spent much time there Fogerty had a good feel for the area and it’s music. 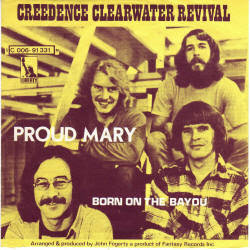 If there was ever a song title that just sounds like it should be a CCR song title- Born On The Bayou would be a great title for a CCR song- and it is! With Proud Mary and Born On The Bayou- John Fogerty had found his voice. There is a cover- on most Creedence Clearwater Revival albums there would be a cover- in this case it is Good Golly, Miss Molly. Fogerty changed the lyrics a little, not a bad cover but nothing that is all that memorable. It’s not their greatest cover or even close. The remaining songs are all John Fogerty originals- and while none of them are bad- [Bootleg and Keep On Chooglin’ I’d rank better than average but far from great and Penthouse Pauper and Graveyard Train are average at best} they don’t come even close to the greatness of Proud Mary and Born On The Bayou. Overall a good album- on the strength of those two great songs a 4 star album- and one that would have had me eagerly awaiting the next Creedence Clearwater Revival album- it wouldn’t be a very long wait. Thanks for such an informative piece on this band and album. I think I’ll be slipping some CCR on the turntable today! I still remember the moment in early 1969 when my sister and I were sitting in our cousin’s bedroom listening to records and she played “I Put a Spell On You.” We were instantly blown away, and my sister quickly became a diehard CCR fanatic (I loved them too, but wasn’t as crazed as she was). Two years later, when they played a concert at the Oakland Coliseum, she won two free tickets to see them. She and I were too young to go to the concert on our own, so our mom had our much older half-brother & his wife chaperone us. It was my very first rock concert. That is a great first concert!